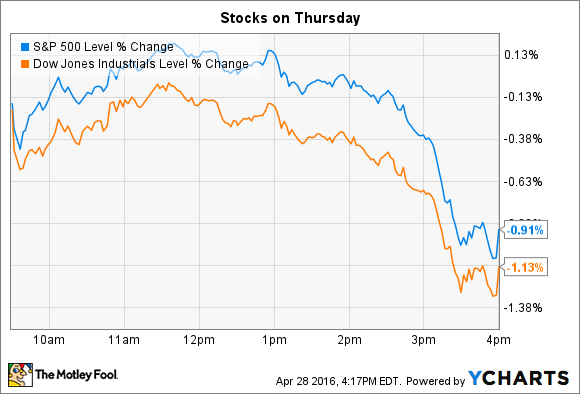 Why these two stocks logged solid gains even as major indexes fell hard on Thursday. In economic news, the government's first estimate of Q1 GDP growth came in at 0.5%, which marked a slowdown from the prior quarter's 1.4% gain. The dip in growth was caused by falling business investments in real estate, lower consumer spending, and a drop in federal government spending, according to the report. The government's second Q1 estimate, which benefits from more complete data, will be released in late May. Meanwhile, individual stocks making notable moves today included Facebook (NASDAQ:FB) and Ford (NYSE:F), which both jumped after announcing quarterly earnings results. Facebook was one of the S&P's biggest gainers, rising 7%, to touch a new all-time high after posting first-quarter earnings results. Sales spiked 52% higher on a 57% jump in advertising revenue. Profits rose at an even faster clip: Net income tripled, to $1.5 billion. "We had a great start to the year," CEO Mark Zuckerberg said in a press release. The social-media giant managed to hit all the right notes in this report. The customer base grew solidly, with monthly users up 15%, to 1.65 billion. Twitter, by comparison, only managed 3% Q1 growth, as its monthly user base ticked up to 310 million. Facebook is also succeeding at monetizing that massive base. Average revenue per user rose to $3.32 worldwide ($12.43 in the U.S. market) -- up 33% year over year. ARPU by quarter. Image source: Facebook investor presentation. Facebook's engagement metrics also improved, which bodes well for future growth. The number of daily users rose 16%, to 1.1 billion. Meanwhile, the company continues to soak up advertising dollars, especially those aimed at the key mobile-browsing market. Mobile ad buys made up 82% of ad revenue, up from 73% a year ago. Ford's 3% pop on Thursday was enough to push the automaker's stock back into positive territory for the year after dropping by 20% through mid-February. Wall Street cheered a surprisingly strong earnings report that included record quarterly profit, and a doubling of operating margin. Ford's $0.68 per share of earnings trounced consensus estimates that were calling for $0.46 per share of profit. The company saw strength across several geographies, with the U.S. region, Europe, and Asia all contributing to the $3.8 billion of pre-tax income it generated. South America was the only region to lose money in Q1, which management attributed to a recession in Brazil, and an overall tough competitive pricing environment. "We expect 2016 to be a great year," Chief Financial Officer Bob Shanks said in a press release. Management's forecast sees healthy growth in the U.S. thanks to rising consumer confidence, and a steady job market. Meanwhile, the European division is on track to kick in solid gains, too, after posting its best profit result since 2008. Overall, Ford affirmed guidance that calls for steady operating improvements over last year's results.